Sources are telling us the fire in Asebot Monastery is contained. But there is a high chance of second breakout. The sources of these "monastery fires" are still misterious. The Holy Syond is learned to have send a delegation of bishops to the monastery. Mahibere Kidusan did a very good job in breaking the news, informing the Church and the people. Bravo Mahibere Kidusan. The cause does not look natural. The latest News can be read here ከዐሥር ቀናት በላይ ሲቀጣጠል የቆየው የአሰቦት ገዳም የደን ቃጠሎ መጥፋቱ ተገለጸ። . Since we post the breaking story a couple of days ago, the German radio Deutsch Welle, Mahibere Kidusan and VOA have reporterd the news indetail. In the same token, the Amharic biweekly Reporter has today printed a news feature.Where are the other ethiopian media? What a shame???? 1. The Reporter Amharic Newspaper Sunday, 30 March 2008 , entitled with "የአሰቦት ገዳም ዙሪያ የእሳት ቃጠሎ ደረሰ: በአንድ ወር ጊዜ ውስጥ የዝቋላ አቦ፣ የዋልድባና የየረር በዐታ ገዳሞች አፅድ ተቃጥሏል"
"በአሰቦት ገዳም የተነሳውን የእሳት ቃጠሎ ለመቆጣጠር የሚደረገው ጥረት ተጠናክሮ መቀጠሉ ተገለፀ"
የእሳት አደጋ በቀላሉ ለመከላከል ከባድ እንደሆነ ይታወቃል፡፡ የኢኮኖሚም ጉዳይ አለ፡፡ አሜሪካንን የመሳሰሉ ሀብታም ሀገሮች እንኳን ሳይቀሩ በበጋ ወቅት የሚነሣባቸውን የሰደድ እሳት ለመግታት በብርቱ ሲቸገሩ እንመለከታለን፡፡ የኛ ደሃው መንግስትማ እንዴት አይቸገር፡፡ ነገር ግን የሚገርመው ለምን ቢያንስ እርዱኝ አይልም? ኢትዮጵያውያን ሀገራቸውና ሀብታቸው እንዲህ እንደዋዛ የእሳት ሲሳይ ሲሆን ነገሩን ለመንግስት ብቻ በመተው መቀመጥ አይገባቸውም፡፡ መላ ምቱ!!!!!!! Follow up story, The Reporter Amharic Newspaper Sunday, 30 March 2008 , entitled with "የአሰቦት ገዳም ዙሪያ የእሳት ቃጠሎ ደረሰ: በአንድ ወር ጊዜ ውስጥ የዝቋላ አቦ፣ የዋልድባና የየረር በዐታ ገዳሞች አፅድ ተቃጥሏል"
Forests of time old monasteries in different localities are burning. According to Deje Selam sources, natural forests of atleast three ancient monasteries are in fire. Zequala Abo, Asebot and Yerer Lideta Le Mariam Monasteries are amongest the reknowned relious place in Ethiopia. Following we have posted a short summary of Why do we need to focus on these Church forests? by a researcher called Dr. Alemayehu Wassie. Deforestation in the northern highlands of Ethiopia is becoming an unstoppable process dating back many hundreds of years. In much of the landscape of northern Ethiopia, the lush vegetation on the hillsides surrounding a church or a monastery presents a sharp contrast to the surrounding bare ridges and mountain slopes. They are the only localities covered by tree vegetation and not affected by gully erosion (Taye Bekele et al. unpublished). Preserving these remnant indigenous woody species in concrete ground before their entire elimination is, undoubtedly, an urgent task. None of the 'externally' designed systems, approaches and dominant conservation paradigms imported and tried so far halted deforestation (Dessalegn Rahmato 2001). Moreover, in the course of carrying out environmental conservation activities, important local traditional institutions that should have been taken into partnership were alienated due to a lack of insensitivity towards them that led to mishandling relations (Yeraswork Admassie 1995). Thus, it is time to take the opportunity of the locally and traditionally tested conservation systems in order to conserve and maintain the vanishing and endangered woody species’ diversity resources and ecosystem in the area mentioned. In this perspective, we have to look into tree conserving traditions of the EOTC, which has been successful in resisting the flood of deforestation for many decades in the area. Despite what the EOTC has done to conserve a significant proportion of the forests in the country, the church does not receive the recognition and support it deserves (Alemayehu wassie, 2002;Taye Bekele et al. unpublished). Thus, we have to recognise this tradition as an opportunity and explore possibilities of using it in future conservation programs. The body of a Christian archbishop kidnapped last month was found in northern Iraq Thursday. Gunmen abducted Chaldean Catholic Archbishop Paulos Faraj Rahho and killed three of his companions soon after they left Mass in the city of Mosul on Feb. 29. It was the latest in a series of attacks against Iraq's small Christian community. Monsignor Shlemon Warduni, the auxiliary bishop of Baghdad, said the church in Mosul had received a phone call from the kidnappers on Wednesday telling them the archbishop was dead. They also told church officials where they could find the body. The Chaldean church is an Eastern-rite denomination that recognizes the authority of the pope and is aligned with Rome. The Vatican said Pope Benedict XVI was "deeply saddened" by Rahho's death. "We had all kept hoping and praying for his release," said Vatican spokesman Rev. Federico Lombardi. "Unfortunately the most absurd and senseless violence keeps dogging the Iraqi people, and especially the small Christian community." In Baghdad, the car bombing took place off a bridge in Tahrir Square, a district of clothing shops just outside the heavily fortified Green Zone, which houses the U.S. Embassy and much of the Iraqi government, a police official said on condition of anonymity because he was not authorized to release the information. The policeman and a hospital official said 18 people died. The hospital official said 57 others were injured. There has been a resurgence of violence in Iraq's capital after several months of relative calm that followed an increase of U.S. forces last year. There also has been a jump in U.S. military deaths in recent days. Twelve Americans have been killed in the past four days, bringing the overall U.S. military death toll since the start of the war to 3,987, according to an AP count. The U.S. military said Thursday that soldiers had killed a young Iraqi girl after firing a warning shot at a woman who "appeared to be signaling to someone" along a road where several bombs had recently been found. The shooting occurred Wednesday afternoon in the volatile Diyala province north of Baghdad. An exact location was not given in a military statement. The girl appeared to be "around 10 years old," said Maj. Brad Leighton, a military spokesman. In its statement, the military said that "coalition forces fired a warning shot into a berm near a suspicious woman who appeared to be signaling to someone while the soldiers were in the area. A young girl was found behind the berm suffering from a gunshot wound." Leighton said preliminary reports indicated that soldiers did not believe the woman was a potential suicide bomber, but rather "they were afraid she was signaling to someone that the convoy was going by." In other violence, five members of an Awakening Council were killed when gunmen attacked two separate checkpoints near Tikrit on Thursday, 80 miles north of Baghdad. Nine others were wounded. Awakening Councils are made up of mostly Sunni fighters who have accepted U.S. backing to switch allegiances and fight al-Qaida in Iraq. A suicide bomber also attacked an Awakening Council gathering in the village of Zab outside Kirkuk, 180 miles north of Baghdad. Three people were killed and seven others wounded in that attack. Gunmen also killed a correspondent for a Baghdad newspaper. Qassim Abdul-Hussein al-Iqabi, 36, was shot while walking in Baghdad's largely Shiite Karradah neighborhood, police said. Excluding al-Iqabi, the New York-based Committee to Protect Journalists has recorded at least 127 journalists and 50 media support workers killed since the U.S.-led war began in March 2003. CBNNews.com - If you want to influence habits, experts will tell you to target young people. Current polls show that many Americans have a negative view of Muslims, especially since the 9/11 attacks. Now the Saudi royal family is trying to change that. They are going to visit some of America's top universities to get their message out. READ FULL STORY AND WATCH THE VIDEO CLIP HERE. A Grand Millennium Exhibition showing the deeds of the Ethiopian Orthodox Tewahido Church over the past two millenniums concluded on Sunday with success, organizers said at the closing ceremony at the Exhibition where it was on show for the past two weeks. The organizers said the exhibition met its desired objectives given the number of visitors who showed great interest in the history of the church- its achievements in evangelical, economical, social, artistic, legal, administrative, ecological, tourism and other spheres of activities. Well over 50 thousand people of different religious faiths visited the 10 day-exhibition which had to be extended for another five days, to allow more people get the chance, Priest Dn.Mulugeta Seyoum, Chairperson of the Mahibere Kidusan Millennium Committee which organized the exhibition on behalf of the church said at the closing ceremony. The exhibition highlighted the Churches contribution and direct role in the country's over all development endeavors. The exhibition also showed the relationship between the church and state institutions, the church's place in Development and social justice, and the church's Administrative structure with parish councils and Sunday schools in focus. Dn. Mulugeta Hailemariam said that by demonstrating the past, present-and the future-during which the church prevailed after many ups and downs, the exhibition aimed to inject citizens' sense of responsibility. He said the committee plans to organize similar exhibition in the regions of the country, including foreign countries-South Africa(in Johannesburg) and neighbor in Kenya (in Nairobi) with a view to extend the church's mission thereby allowing more and more people benefit out of the historic event. Government ministers, ambassadors and head of missions of sates and governments, members of the international community, higher governmental officials, the patriarch and holy fathers attended the closing ceremony. Mahibere Kidusan has been preparing various exhibitions since 1996 both in the country and abroad under the broad theme of Ethiopian Church Yesterday, Today and Tomorrow. I came across an inspiring video of the legendary poet Tsegaye Gebremedhin called "Petros Yachin Seat". Worth viewing. Yeabatachin YeAbune Petros Tselot Yetebeqen!!! 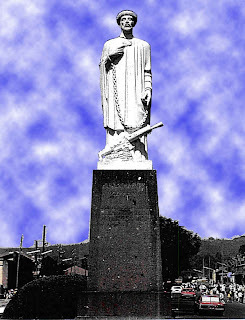 Abune Petros was born in 1892 in a farmer family in the city of Fiche, which is situated north of Addis Ababa. He got the baptismal name Hailemariam that means power of Maria. As the custom of the Ethiopian Orthodox Church (EOC) tradition he got a special bishop name, that is PETROS with the Ethiopian title for a bishop which is ABUNE. As a young boy Abune Petros was known as clever, helpful and humble disciple in the church and city of Fiche. He chose early to study the EOC diakon and priest education. At the age of 24 he took the EOC oath and became a monk. He grew up and became a principled and well-known teacher around the monasteries in Fiche and Wolamo areas. In 1918 he was assigned by the EOC as the teacher and priest for the Debre-Menkrat monastery church in the region of Wolamo. Abune Petros continued to teach there when in 1924 he was assigned as the main teacher for the well-known island monastery-church of Mary, which is situated inside Lake Zewai in southern part of Ethiopia. He was well known for his teaching and preaching to the people around the region to seek first the kingdom of God: “ To put on a heart of compassion, kindness, humility, gentleness and patience. “ (Colossians 3:12) His teachings and preaching were very popular and insightful to the people in the area and the disciples he teaches in the Monastery. In 1928 in connection with the nomination of Ethiopian bishops in the St. Marks Monastery in Alexandria, he was nominated to one of four bishops of Ethiopia, with the title and name ABUNE PETROS. Historical Churches older than Lalibela are renovating. The above news is excerpted from the government affiliated news agency Walta. One is utterly confounded when the literal and real translation is understood. Why do our Muslim friends hide the true meaning of pbuh? It is because the Arabic statement is embarrassing since it contradicts Muslim doctrine? How is Allah supposed to pray to Muhammad and greet Him or anyone else for that matter? Does Allah pray? And if He does, to whom does He pray? Is this passage not contrary to Muslim theology, which teaches that Allah is prayed to but He never prays to anyone else? Or does Allah really pray to other human beings or only to Muhammad, Allah’s own prophet? The confusion of this popular Islamic expression leaves one perplexed and hanging in the air." PLease Read this very interesting article entitled "Islam Unveiled". I read this article few days ago. Adwa is not only a victory of Ethiopians more over the entire African continent, but it has been a revelation of the Christian Ethiopia .A Revelation that God has performed .A response for the great faith of Ethiopians. When we look back to our history Ethiopian kings, highest, Soldiers and people prayed in front of God for victory as one United Nation .Because they believed that God has to lead them in their every step. It was in every individual heart and soul that a leader, from Patriarch, kings to Grazemach are anointed by God. As a result success and victory was achieved. They had the deepest believe that the Lord of the Israelites will lead them and protect them. They carried the Arc of the Covenant to the battle field and when exiled from their country just like the Isrealites. Adwa’s miraculous victory was witnessed by non Ethiopians (Italians); the whole world for that matter. They saw him, the Patron Saint, in his white horse galloping on the grounds of Adwa. This The win in Adwa says: Ethiopia is land of God (Hagre EgeziAbehaer ) ,its says Ethiopia victory is through GOD with in the belief that is Ethiopian Orthodox Christianity. Sometimes it is beyond our imagination especially for us living in this chaotic time .In this regretful era of betraying political leaders and dissension in views of church fathers might tend us to forget how Thy Lord’s ears are open to our prayers, how close God is the Tewahedo church. Our fore fathers has given us a prayer discipline to pray for the poor ,those in sickness, the holy, the clergy ,the faithful, the weak ,our country and the soldiers. The soldiers that St. George will help as he did ,the soldiers that protects the country so why don’t we hear that prayer any more? Especially those of us a broad has our greedy selfish pride hold us from saying ‘Ekeb hizba weserawita lehageriten Ethiopia’? What shall I give Thee, Lord, in return for all Thy kindness? Glory to Thee for Thy love. Glory to Thee for Thy mercy. Glory to Thee for Thy patience. Glory to Thee for forgiving us all our sins. Glory to Thee for coming to save our souls. Glory to Thee for Thine incarnation in the Virgin's womb. Glory to Thee for Thy bonds. Glory to Thee for receiving the cut of the lash. Glory to Thee for accepting mockery. Glory to Thee for Thy crucifixion. Glory to Thee for Thy burial. Glory to Thee for Thy resurrection. Glory to Thee who were preached to men and women. Glory to Thee in whom they believed. Glory to Thee who were taken up into Heaven. Glory to Thee who sit in great glory at the Father's right hand. through Thy great mercy and compassion. On March 1st 1896 a major battle took place in Adwa between an all-Ethiopian army headed by Emperor Menelik the second and an Italian colonial army commanded by General Oreste Baratieri. It ended with a decisive Ethiopian victory. Glory to God of St. George!!!! 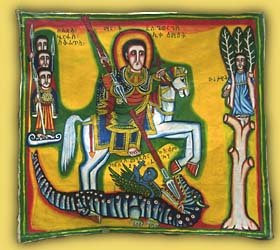 The Ethiopians took St. george's Tabot and God granted them all victories. "The confrontation between Italy and Ethiopia at Adwa was a fundamental turning point in Ethiopian history," writes Henze, who compares this victory to Japan's naval victory over Russia at Tsushima. "Though apparent to very few historians at the time, these defeats were the beginning of the decline of Europe as the center of world politics." On a similar note, the Ethiopian historian Bahru Zewde observed that "few events in the modern period have brought Ethiopia to the attention of the world as has the victory at Adwa;" however, Bahru Zewde puts his emphasis on other elements of this triumph: "The racial dimension was what lent Adwa particular significance. It was a victory of blacks over whites. Adwa thus anticipated by almost a decade the equally shattering experience to the whites of the Japanese victory over Russia in 1905." This defeat of a colonial power and the ensuing recognition of African sovereignty became rallying points for later African nationalists during their struggle for decolonization, as well as activists and leaders of the Pan-African movement. As the Afrocentric scholar Molefe Asante explains, "After the victory over Italy in 1896, Ethiopia acquired a special importance in the eyes of Africans as the only surviving African State. After Adowa, Ethiopia became emblematic of African valour and resistance, the bastion of prestige and hope to thousands of Africans who were experiencing the full shock of European conquest and were beginnng to search for an answer to the myth of African inferiority." God of Our Fathers, give us this day victories over hate, poverty, selfishness, sin.